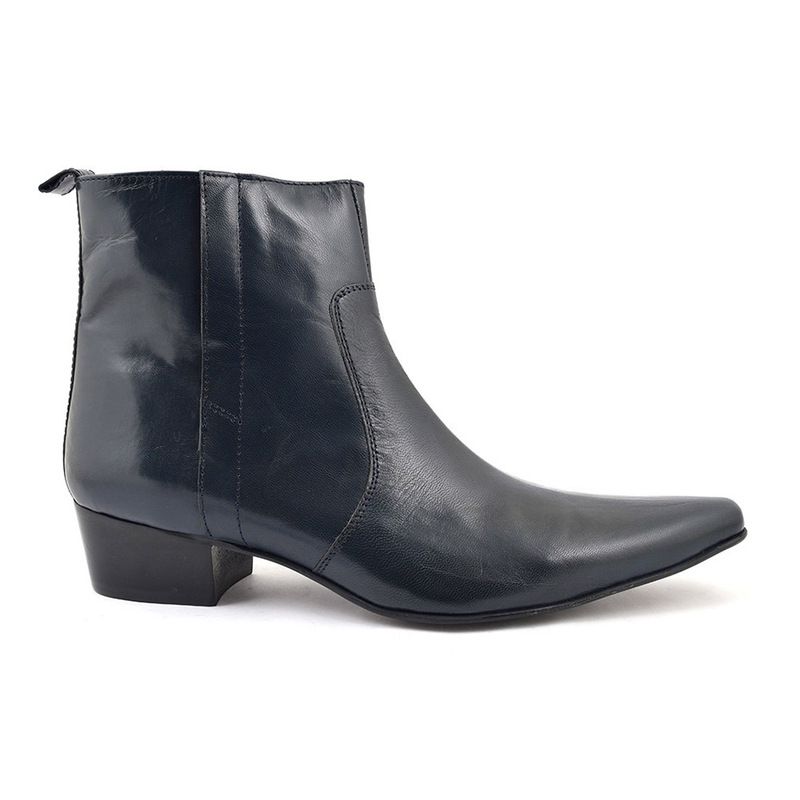 Gorgeous navy heel boots with a 45mm heel. 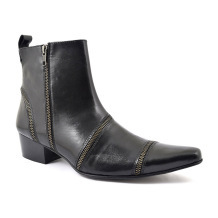 Made in leather, it has a pointed toe much like a winkle picker, subtle stitch detail and fastens with a zip. Stand proud in these slightly distressed boots. Did you know these were originally commissioned by the Beatles? See below for a snapshot of this. 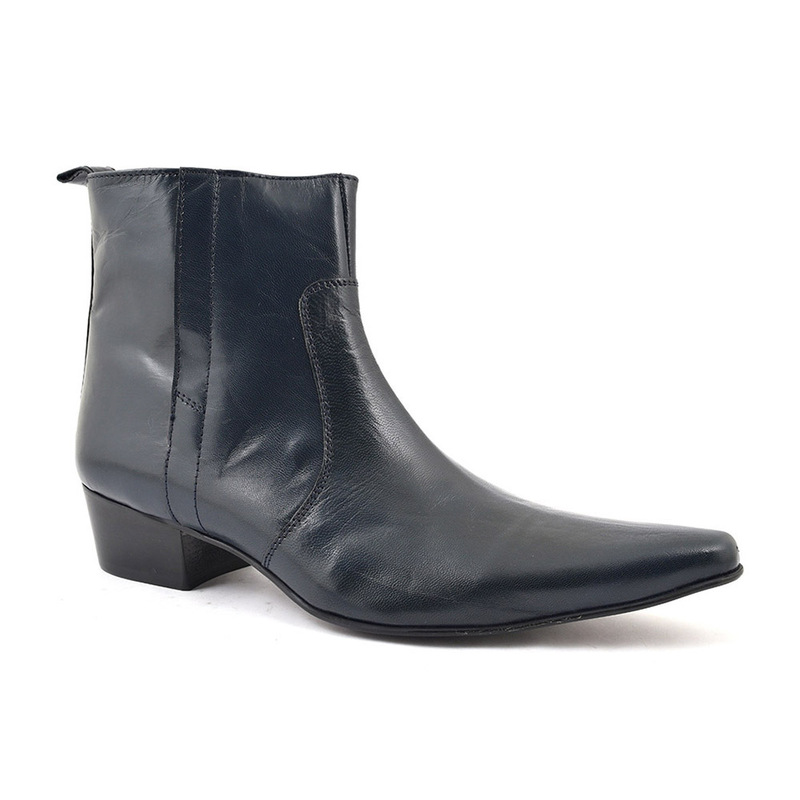 This mens navy cuban heel boots has many, lets say, interesting names which give a feel for the decadent nature of this boot: brothel creeper (nice! ), beetle crusher or winkle picker. The latter two we can explain and we will leave the first to your imagination! In England a seaside tradition was to eat periwinkle snails which were picked out of their shell with a pointed object. So it was out of humour these mens pointed toe boots got their name. So you get the reason they also became known as beetle crusher or mosquito chasers. Teddy boys loved this style of boot as did mods. On the other hand we have the cuban heel on these which derive from Latin dance and became iconic after The Beatles took a shine to them (hence the name). 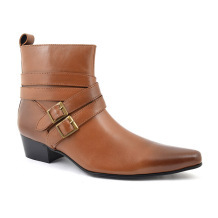 Its hard to define these boots exactly but they are a good mix of winkle picker and cuban heeled mens boots. They have a diverse following in many subcultures such as mods, rockabilly, punks, goths. The commonality is that they have an underground feel and modern day wearers include Noel Fielding and Indie bands like The Horrors. They are worn by men who have their own original style. 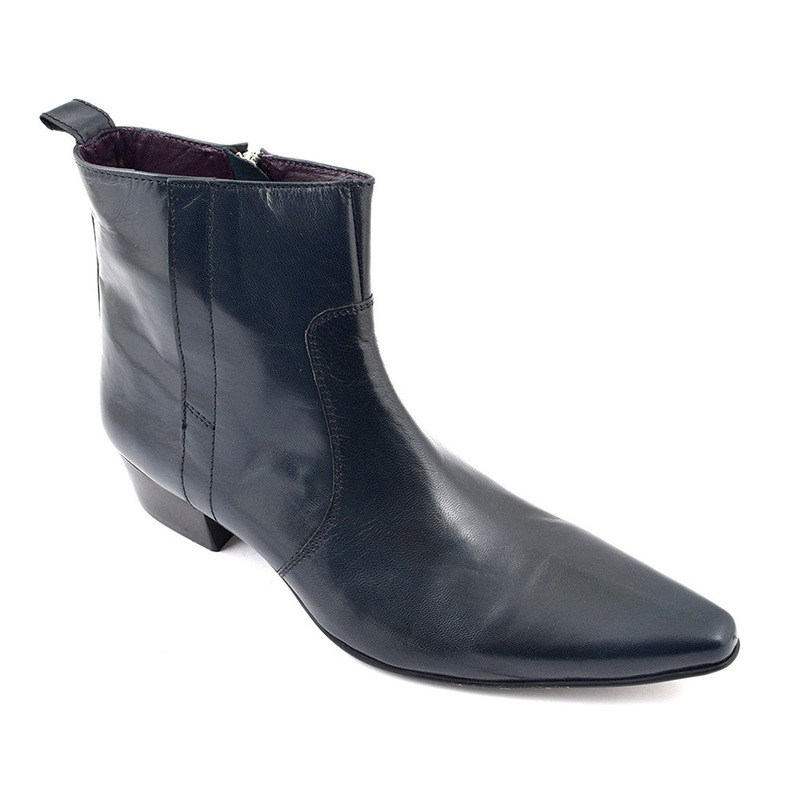 This navy heel beatle boot is a breeze to wear with its zip and the colour is cool. 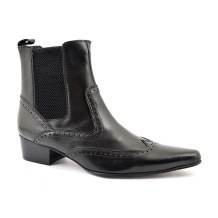 If you are looking for some rock and roll mens stylish boots to go and have a laugh in, these will not disappoint. 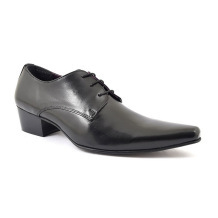 Wear with super skinny jeans for a grungy look or a sharp suit for a modish look. These navy cuban heels are the business. 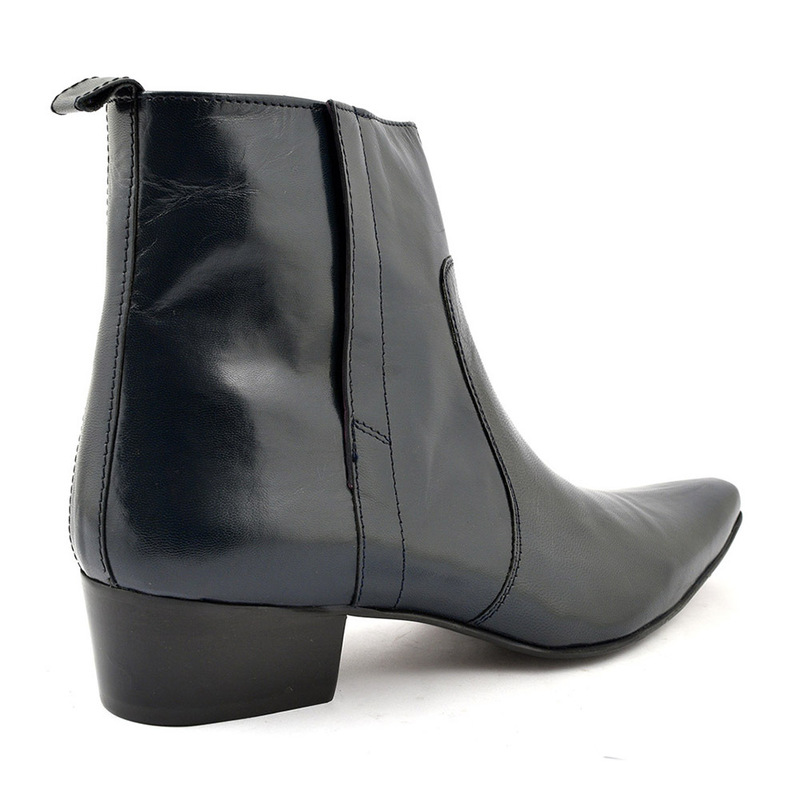 Be the first to review “Alvares Navy Heel Beatle Boot” Click here to cancel reply.